Accessible to all readers, including students of secondary school and amateur technology enthusiasts, Robotics, Mechatronics, and Artificial Intelligence simplifies the process of finding basic circuits to perform simple tasks, such as how to control a DC or step motor, and provides instruction on creating moving robotic parts, such as an "eye" or an "ear." Though many companies offer kits for project construction, most experimenters want to design and build their own robots and other creatures specific to their needs and goals. With this new book by Newton Braga, hobbyists and experimenters around the world will be able to decide what skills they want to feature in a project and then choose the right "building blocks" to create the ideal results. In the past few years the technology of robotics, mechatronics, and artificial intelligence has exploded, leaving many people with the desire but not the means to build their own projects. The author's fascination with and expertise in the exciting field of robotics is demonstrated by the range of simple to complex project blocks he provides, which are designed to benefit both novice and experienced robotics enthusiasts. The common components and technology featured in the project blocks are especially beneficial to readers who need practical solutions that can be implemented easily by their own hands, without incorporating expensive, complicated technology. 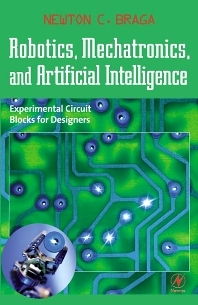 "Accessible to all enthusiasts at all levels, including students and amateur technology hobbyists, this book provides inexpensive and creative robotics projects. It covers a wide range of electronics disciplines, including interfacing with computers, home automation, mechanics, and more. The comprehensive project blocks make it possible for readers to pick and choose the circuit elements for individual robotic projects. From how to control a DC or stepper motor to instruction on creating moving robotic parts- this book covers it all.